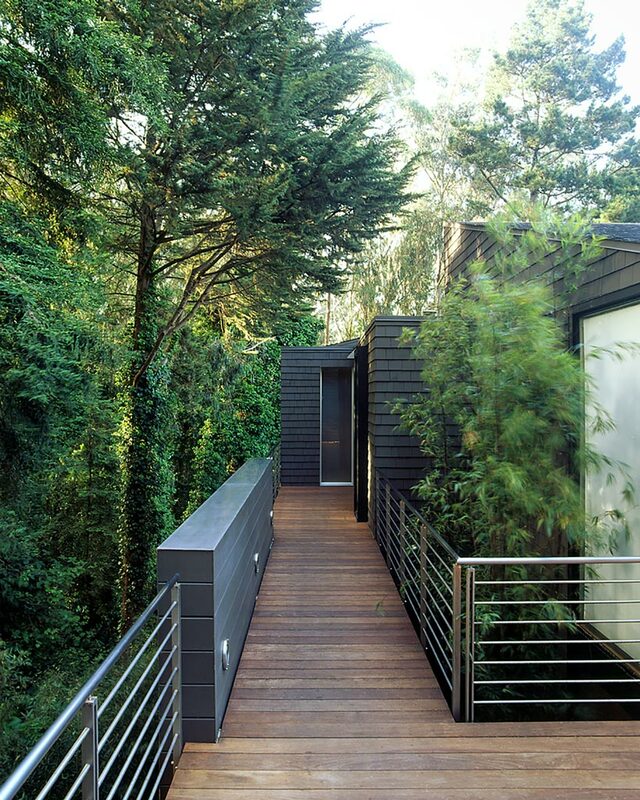 A celebration of modernism and urban nature, this residence occupies a rarified site in San Francisco—the very private property is cloaked in a lush eucalyptus grove, while still revealing incredible views toward San Francisco Bay Bridge and the east. The owner’s minimalist aesthetic and vision guided the design—posing a welcome opportunity to contrast the super clean lines of the new home with the wild, rugged feel of the site. Rising up from an existing footprint, the new 4,500 sq. ft. home asserts itself subtly—in cool, angular form with custom metal elements, accessed by a bridge of sustainably harvested ipe. 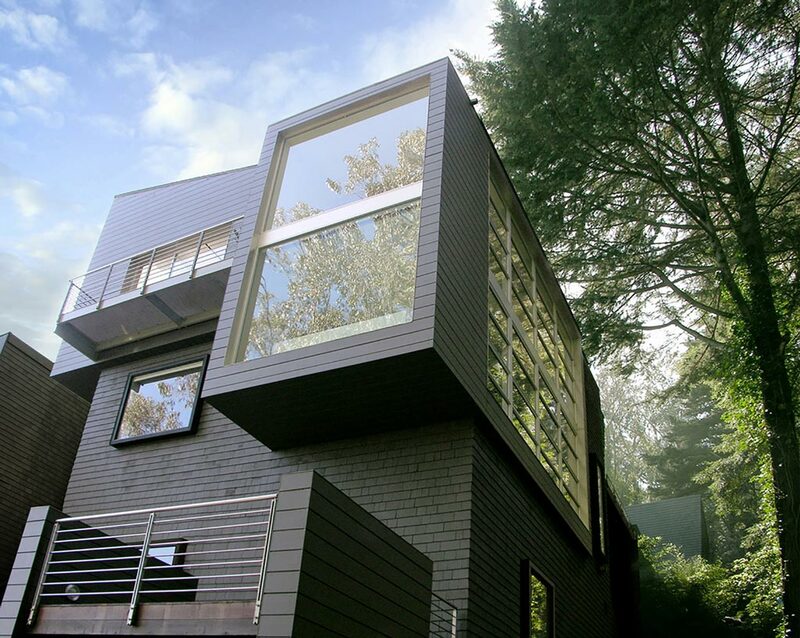 Thoughtful design decisions about visual access, both from the inside and outside, informed the envelope—with floor-to-ceiling window walls used wherever we could to give the sense of living in the trees, and strategic use of clerestory windows for privacy. The open plan is designed to maximally connect with the site, with beechwood floored living areas that can be expanded and reduced as needed with sliding pocket doors. 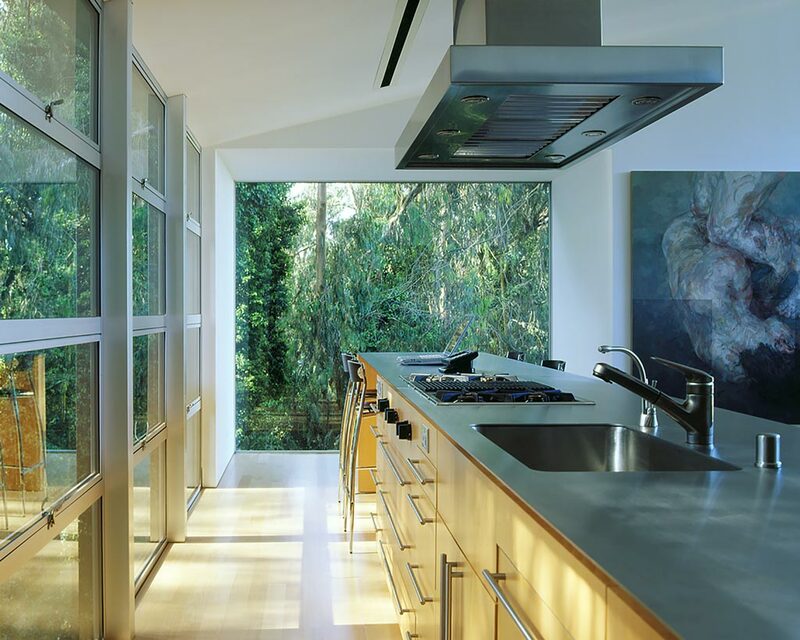 The kitchen’s custom 20-foot stainless-steel countertop had to be installed via a crane on top of the house due to the complex site access. Features include a media room, custom-built dressing room, spacious master bathroom with shower enclosure of acid-etched Bendheim glass, and owner’s studio/office. Near elimination of wall switches was accomplished by wiring the house with a virtually invisible whole house system, neatly concealed in a closet and operated remotely.